Care Packages for Homeless Cats and Kittens! 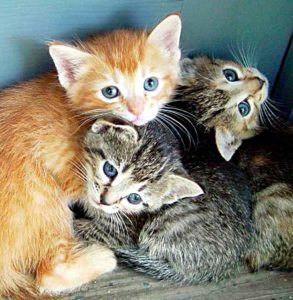 It’s “Kitten Season” and shelters are brimming with cats and kittens. Providing food, bedding and medical care is so important… but also very costly for shelters that are working so hard to care for their growing cat population. A soft bed, nutritious food and proper vaccinations make a big difference in the well-being of these cats and kittens. And… happy, healthy and well fed cats have a much better chance of being adopted! You can help. Just $10.00 provides 100 bowls of food, one soft bed and the vaccination of one shelter cat!